Lemon originated in Asian countries such as India and Malaysia. Alexander introduced the thirst quenching lemon to Europe and Middle East during the third century. Later Arab traders popularized the fruit to other tropical countries. Now lemons are cultivated world wide. 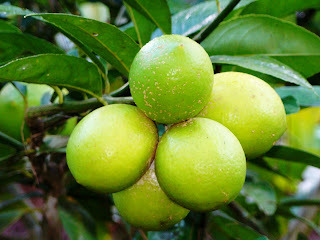 Lemons or lime fall into the citrus fruits. The scientific name for lemon is citrus limon. In India it is also known as limbu, Bara nimbu, nyomb, naranga, yelumichai payam etc. The lemon's sourness comes from its high citric acid level, which, in addition to its wonderful flavor and aroma, can slow the oxidation in cut fruit, ward off scurvy, change milk into buttermilk, remove stains and odors from your hands, "cook" fish without heat, and discolor aluminum pans! Meyer lemons, much sweeter and completely edible from peel to juice, are gaining popularity. Frank Meyer, a renowned plant explorer for the USDA, brought the ornamental Meyer lemon tree to the U.S. from Beijing in 1908. Lemons are high in vitamin C and potassium, and also contain limonene, a compound shown to have anticancer properties in laboratory animals. Limonene also appears to raise the levels of beneficial enzymes in the liver. Vitamin C also can lower histamines in the body; histamines are naturally occurring chemicals that can cause red, itchy eyes and runny noses. Recent research at the University of Arizona found that people who use citrus peel in cooking, baking or in their tea have less risk of skin squamous cell carcinoma (skin cancer). Other research published in the Journal of the American Medical Association found that people who eat more grapefruit, lemons and oranges, and other fruits and vegetables high in potassium, have reduced risk of stroke. And the membranes between citrus segments provide pectin, a soluble dietary fiber that helps control blood cholesterol levels. Also lemons can be used as a home remedy for blemishes - apply a little lemon juice mixed with water several times a day. This can help healing plus remove the red. All citrus are high in flavonoids (the most common antioxidant found in fruits and vegetables, thought to reduce formation of substances that cause cancer and heart disease.) They also contain terpenes, phenols, and isothiocyanates—plant chemicals that are thought to help to prevent cancer.